The state's Department of Natural Resources has not enforced a law that forbids fences across the Sauk River in central Minnesota. 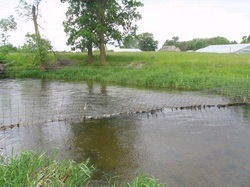 It is a misdemeanor to obstruct public waters, but farmers continue to run fences between pasture land divided by the river. The fences, sometimes electric or barbed wire, pose a serious risk to canoeists and kayakers. "[The Sauk River] was designated as a state water trail in 2006 and so our first efforts were in putting a map together and getting information on the website," Erik Wrede, DNR water trails coordinator, said. "Now just recently we've been getting information that there are fences on the Sauk." The DNR had location data of fences along part of the river in 2008. Members of the Sauk River Watershed District who canoed that portion used GPS technology to map the fences and other blockages in the river. They relayed this information to the DNR at that time, but Wrede said the agency did not act because the information covered only part of the river. Wrede is waiting for the completion of a trip, under way now, by Scott Miller and Todd Foster. The duo is mapping all of the hazards along the 125 miles of the Sauk including fences. One the DNR receives their data Wrede says the agency will start working to bring farmers into compliance. "We want to do it in one fell swoop instead of piecemeal," Wrede said. Wrede cites difficulty in determining who the landowners are, even with GPS data of the location of some of the fences. The agency also wants to engender goodwill with the farmers that have used the land in this manner for generations. Miller and Foster are taking a week to paddle the Sauk and have encountered a few fences, less than have been encountered on previous trips. But at this point they are only halfway though and have a significant amount of farmland to pass through yet. You can follow Miller and Foster on their blog as they update along the way.